This is one of those products where smell affects your mood. I love the way it smells, and it makes me happy. The Body Shop is a great company that supports natural products and that makes me want to purchase there all the more. 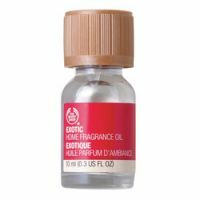 Exotic was one of the first oils I ever purchased from The Body Shop. After many years, it is still one of my favorites! This oil will absolutely fill your home with the most amazing fragrance. It is fruity and sweet, but I love that you can't pinpoint a specific fruit scent. I have tried many of the oils and this is one of the strongest scents. I love this scent any time of the year! I bought this scent almost 10 years ago and I still love it. It is also great when mixed with other fragrance oils. The Body Shop's Home Fragrance Oils and Burners is one of the best purchases I have ever made.